Since I have met one of my school teachers and spoken over phone to another two in the last three days, it is time now for another nostalgic post. The teacher I met taught me maths at Kendriya Vidyalaya (KV). I and my friends were 'outstanding' students in more than one way - in the same period, we would get praised for quickly solving a tough maths problem (outstanding), and soon be sent out of the class as punishment for talking in the class (standing out). One of the other teachers I spoke to today was our class teacher in tenth standard. She is one of the most sportive teachers I have ever met. Once one of my artistically gifted classmates had drawn a picture of devil on the blackboard. He couldn't erase the picture before this teacher came to class. When she sat down on her chair, the picture was directly behind her and the whole class started laughing. She turned at look at the picture and asked, "Is that me?" "Yes ma'am", the whole class replied, though the artist never meant it that way. "Good drawing skills" was her remark, without any anger. In contrast, out physics sir would have given a sound thrashing to the poor chap, and the whole class would have to listen to a lecture on 'showing respect to teachers'. How ironical that by her reaction she more than won our respect. Looking back, I realise that this same teacher was also one who practiced management principles in school (we didn't realise it then - performance based incentives, mentoring, 360 degree performance appraisal, etc were unknown terms to us then). Our seating arrangement in the class was decided by her as the class teacher - anyone who scored full marks in maths uni test (the subject she taught) could have a seat of his/her own choice till the next unit test - performance incentive. She arranged students in such a way that a bright student was seated next to a no-so-bright student, so that the brighter students could mentor the others. At any point in time during her class, if anyone felt that she was not teaching properly, or was deviating from the topic, one could raise his/her hand and tell it openly (360 degree performance appraisal). Today I spoke to her after many years as I had got her number only 2 days back. I could feel the excitement in her voice. I asked her how it was at the KV she taught now. "It's the same... every year old faces pass out and new faces come in. Once in a while I get calls from old students, which makes me happy. Hearing from old students - that is the best gift you can give to your teachers". I dedicate this post to all the teachers who helped me make who I am. My parents give full credit to my teachers for all the marks I scored in school, as I seldom studied at home. The first time I traveled in the overhead Mass Rapid Transit System (MRTS) in Chennai around three years ago was out of curiosity. 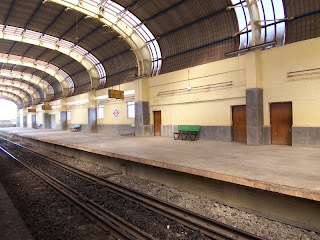 My home state of Kerala doesn't have metro rail in any of its major cities, let alone one that runs on elevated tracks. 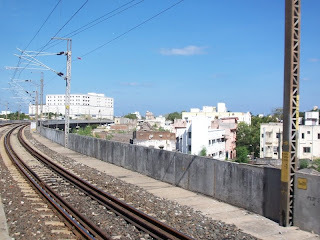 I became a more frequent user of the MRTS after I shifted my residence to Adyar area, which made Kasturba Nagar station just 5 minutes walk from my house. By then railways had extended the service to Velachery and increased the frequency to once every fifteen minutes. This mode of transport made an excellent alternative to the slow, crowded MTC buses, and the extremely expensive autorikshaws (one has to shell out anywhere between 100 and 150 to travel from Chennai Central to Adyar). At Rs 6 per ticket, and a travelling time of just 20 minutes, MRTS trains are a relief, the only grouses being that the services stops before 9 pm, and that most stations are in bad shape. The station at Kasturba Nagar (at Madhya Kailash signal) sports modern looks (at least most part of it), though the one at Indira Nagar is pathetic. Now that the usage rate has gone up, I hope that railways begin to keep the stations properly maintained and well lit. Do one-ways really solve traffic problems? If my personal experiences in Chennai and Bangalore are anything to go by, they do not. They simply divert un-necessary congestion to more places. Take the case of Little Mount- Raj Bhavan - Halda triangle one way system in Chennai - I personally feel that this arrangement has only made life difficult for pedestrians. The waiting time avoided at the signals have been replaced by waiting time in front of Little Mount court for pedestrian crossing. And if there is no policeman around, then it is impossible for a pedestrian to cross the road, as the road is very wide and all vehicles speed up on this road. In the evenings, the road from Raj Bhavan to Halda Junction (towards mount road) is congested as was the case before the introduction of the one way system. Similar is the case with TTK road/CP Ramaswamy Road, though I think it is too early to take a call on this. Traffic has somehow tremendously increased in the last two years and I find more and more roads in Chennai becoming one ways, like it happens in Bangalore. I would like to add a new definition to the term Bangalored (the real one being this whereas my definition is based on personal experiences) - "the feeling you get when you carefully plan your trip from one end of the city to another, only to find at a crucial junction that it had been made a one way overnight! And that you would need to drive at least 2 km extra to overcome this hurdle".